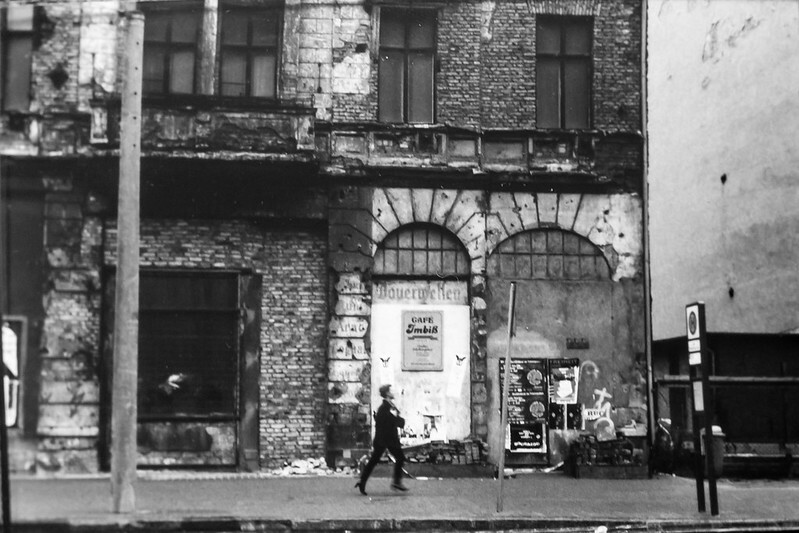 In 1992, while I was an undergraduate at Bath university, I went to Berlin for an industrial placement year. I had started out registered for a 3-year maths degree without a placement, but there was a scheme you could apply to if you changed your mind and fancied going abroad in the middle of it. Hardly anyone applied for it, and I don’t think any applicants from my course were rejected unless they failed their end-of-year exams. 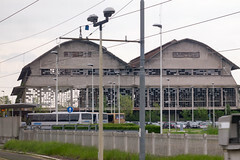 I was to work at the Konrad-Zuse-Zentrum (ZIB), a computing research institution that at the time was based in Charlottenburg, a tidy part of west-central Berlin. My girlfriend, also at Bath but studying languages and responsible for encouraging me to apply to go abroad in the first place, had managed to arrange a study year at the Freie Universität. She moved in to a student residence and I into a modern one-person flat organised by the company, in Mariendorf, in south Berlin. Mariendorf wasn’t very exciting and my girlfriend’s hall of residence wasn’t all that great, so after a few months we decided to find a new flat together. 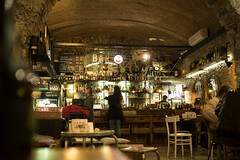 My spoken German was just functional, hers was good, and between us we spent a lot of time talking to Mitwohnzentrale agents and looking around flats until, in February 1993, we rented a flat in Alte Schönhauser Straße, near the centre of what had been East Berlin. 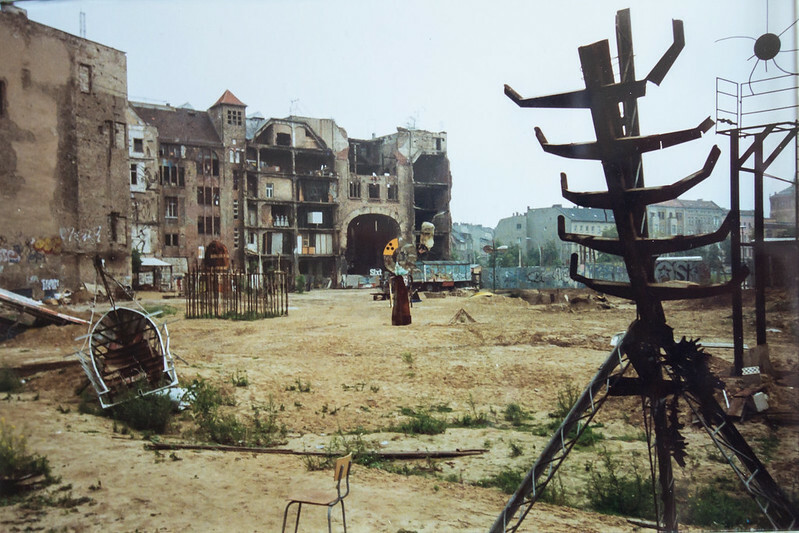 Central (eastern) Berlin, 1993 (Falkplan). 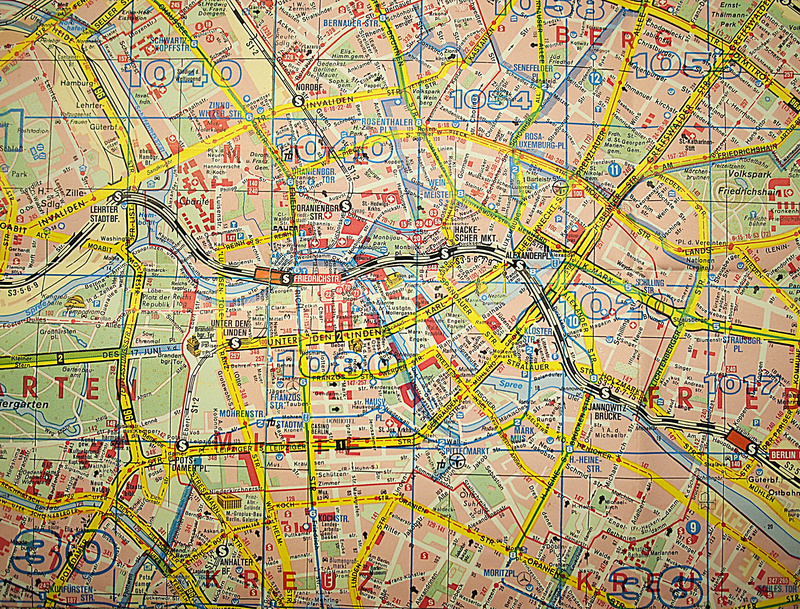 Central (eastern) Berlin, probably 1975 (RV Stadtplan). 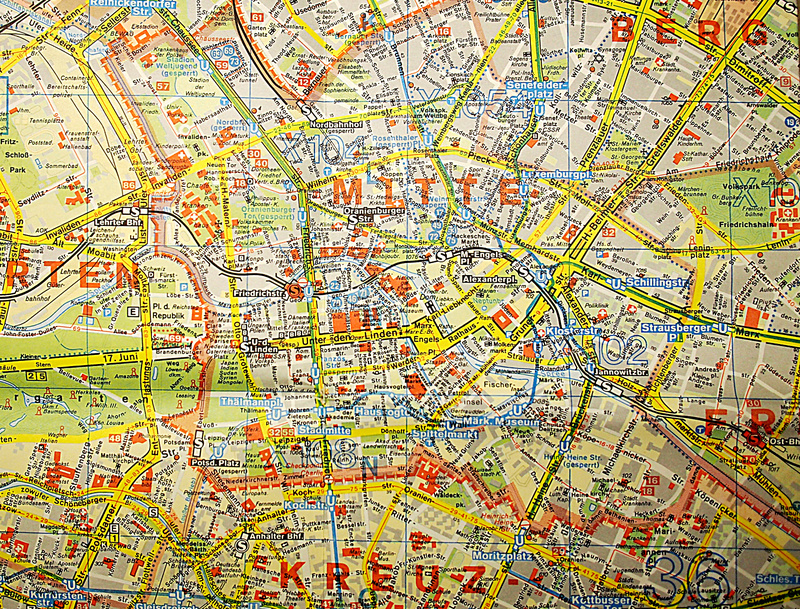 This undated map includes the U-Bahn stations that opened in 1973, but shows the 1976 and 1978 openings as “in planning”. In 1993 the area was still a bit of a mess. Many buildings on major streets like Rosenthaler Straße and Neue Schönhauser Straße were pocked with bullet holes or had obvious bits missing. What is now the fancy paved square filled with outdoor cafés, outside the S-Bahn station, was just a road. One of the commercial streets now present (An der Spandauer Brücke) was then a scrubby park, I assume because the buildings had been pulled down after the war and were not rebuilt until the area was restored. The now-restored Hackescher Hof complex was an unremarkable grey residential building: I had no idea there was supposed to be anything interesting about it. It could all feel a bit bleak. Street scene, 1993 – but I’m not sure exactly which street. If you know, I’d love to hear. But this was a thrilling area to live in as a transient foreigner at the time. 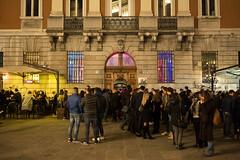 Many of the most decaying buildings were temporarily housing intimidating and/or tantalising makeshift bars, cafés, or art venues, like autonomous growths forcing themselves up through the gaps in what had once been reliable, gentlemanly turn-of-the-20th-century buildings. From Hackescher Markt up Oranienburger Straße to the looming art-project squat of Tacheles the area was full of a sort of place I had never seen before. It all seemed sudden, urgent, about to collapse. I knew very little about any of it and I can hardly even characterise myself as a participant, but I loved being able to be there. The flat had four rooms, much bigger than the modern one I’d become used to, and it was I think smartly decorated and desirable for its time and place, but it did have certain limitations. Each room had a coal-fired heating stove, which worked pretty well, but of course you had to bring coal up in a bucket from the cellar and light a fire in each stove some time before you needed the heat. These stoves were commonplace at the time, so the air around smelled of coal smoke in a way that western cities hadn’t, I imagine, for some decades by then. There was no bathroom; the loo was outside the flat, shared with the flat next door. Hot water was through a small electric heater above the kitchen sink that could provide about a kettle’s worth. The owners had installed a standalone electric shower unit in the utility room, which was very natty but a bit ineffectual: switch it on, wait ten minutes for it to heat up, get in, enjoy two minutes of warm water. 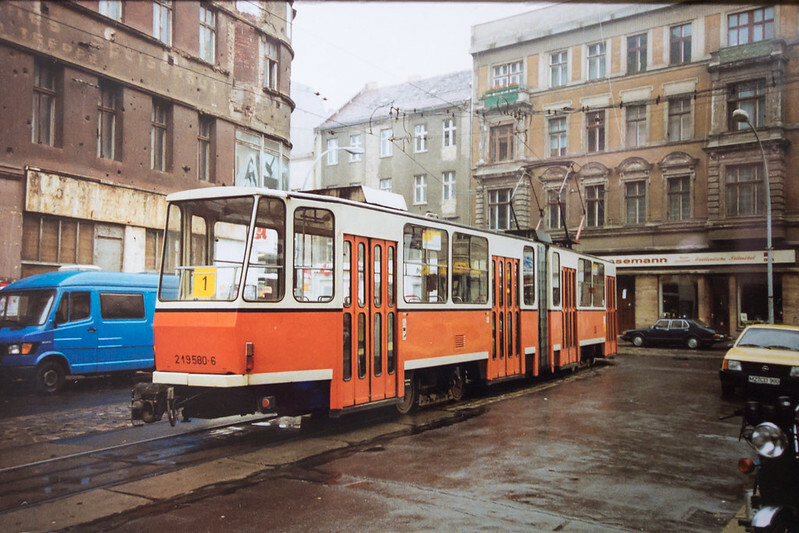 Still, it was a lovely flat, and I loved the coal tang of the cold night air and the late-night sound of the Rosenthaler Straße tram, its swooping creak as it slowed for a tram stop, carried to the window across the wasteland at the back of the building. As it happened, when the day came to move all our belongings to the flat, I was alone: my girlfriend was temporarily in the UK with her family. We didn’t have all that much stuff, so I thought I could just load up a backpack and take it on the U-Bahn. I took three or four loads from my flat and three or four from her rooms, and by the time everything had been moved, it was late and I was very tired. I dumped everything and fell into bed. February in Berlin can be very cold. I woke up early in the morning and found it difficult to move my limbs. I could move my head, but when I did, a crushing pain rolled through it. I’ve never known a headache to compare. I realised that I couldn’t move because I was too cold, and that I needed to do something about it. But I’d forgotten to bring up any coal before I fell asleep the previous night. To warm up, I would need to pull on some clothes, find a bucket, make my way out of the flat and down to the unfamiliar cellar, fill up with coal, drag the bucket back up, set up and light a fire, and hang on long enough for the stove to warm up. It was a painfully long journey for such a simple job. I’ve been back a handful of times since 1993, though sadly never for long enough to get beyond the initial phase of just boggling at things that have changed. The really obvious changes are of course along the stretch of the Wall, like the whole new Potsdamer Platz, but it’s the details like shops and venues, or changes to transport layout, that are the most interesting for me. 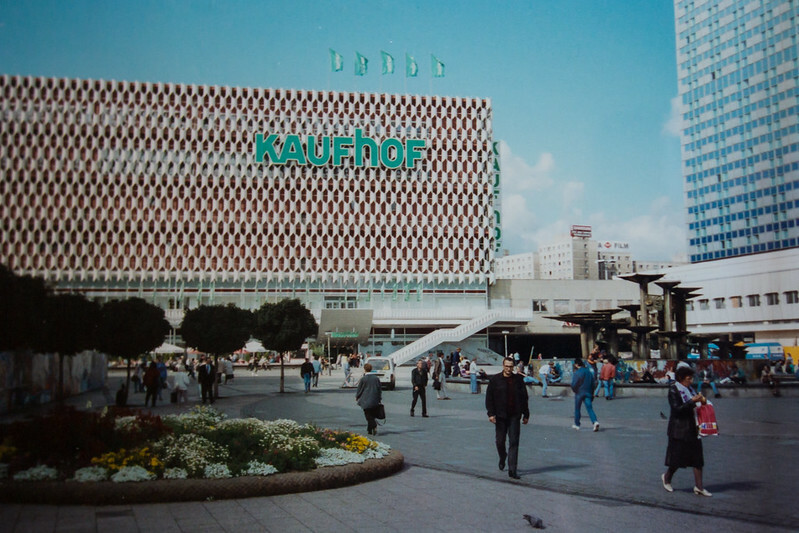 Kaufhof (former Centrum department store), Alexanderplatz, 1993. At the time the food store here was still a decent place for a normal weekly shop. It’s much more upmarket now. Some of this has to do with the time-telescoping effect of getting older, but it also has to do with not being there. If I’d been working there while all this was happening, I would probably be unable to remember what it had ever been like before, just as I can hardly remember what London’s Docklands area was like before its second big wave of building at the turn of the millennium.